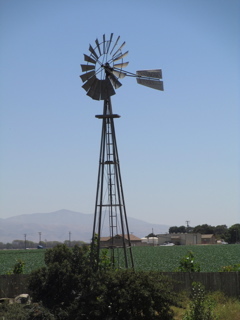 The old windmill on the Pessagno Winery property harkens back to the agriculture history of the region. SLH is in Monterey County, but inland, on the hillsides of the Santa Lucia mountain range overlooking the Salinas Valley. 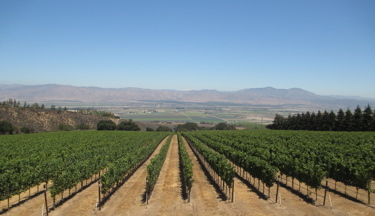 This valley runs essentially east-west, similar to the Santa Rita Hills (SRH) area in Santa Barbara County, and similar to the SRH AVA gets ocean breezes to keep the temperature down during the day. This area benefits from a long growing season, with early bud break and late harvests. Maybe a closer comparison would be to the Corralitos area at the southern end of the Santa Cruz Mountains AVA, which has very similar characteristics, and specializes in the same grapes: Pinot Noir and Chardonnay. 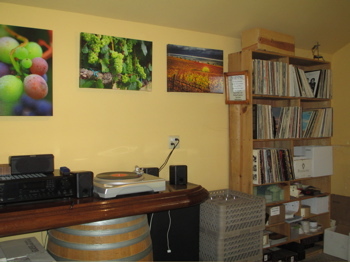 The tasting room at Pessagno Winery has a turntable with a nice collection of old LPs. The first winery we visited was Pessagno Winery. In the photo above you see one of the reasons we’ll be returning: the turntable and the vinyl albums. Gerre (pronounced like “Jerry”), who was behind the tasting bar for us, is a huge Eric Clapton fan, and a Clapton greatest hits album was on. (Which brought up the question of the Derek and the Dominoes version of “Layla” versus the Clapton Unplugged version, but we hadn’t had enough wine yet to really get into that discussion.) We started tasting through the lineup of Pessagno wines, including Chardonnays and Pinot Noirs, which is what the SLH region is known for. At the end, there were a couple of Zinfandels, made from grapes purchased in the adjacent San Benito County. We really enjoyed the 2011 Zinfandel from Idyll Times Vineyard, and bought a couple of bottles. View of the Salinas Valley from the Hahn Estate tasting room. The second winery we visited was Hahn Estates. This is a much bigger winery – around 300,000 cases per year versus 5,000 for Pessagno – with a few different labels that they make and distribute wine under. The tasting room is very nice, and they have a lot of the wines available for tasting. You can choose which ones to taste, 6 to a flight, with the fee waived upon purchase. With wines available starting at $14 each, it’s not hard to choose a bottle and waive the fee. Just like at Pessagno, the Chardonnays and Pinot Noirs were not our favorites. Instead, we left with a bottle of the 2012 Hahn Winery Chef’s Cuvée from Paso Robles, a blend of the white Rhone varietals Marsanne, Roussanne, Grenache Blanc, and Viognier. While we really liked this wine, the best reason to visit Hahn is the view, which is spectacular. With a great deck and tables outside, think about bringing your lunch, grabbing a bottle and enjoying the day. The terrace at the Hahn Estate tasting room is a great place to enjoy a glass of wine. 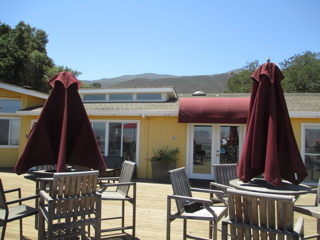 If you’re not bringing your lunch to Hahn or another winery, try El Camarón in Soledad for lunch. This Mexican restaurant specializes in seafood (camarón is shrimp in Spanish), and makes a few different versions of ceviche. I got a shrimp ceviche, Lori got a chicken tostada, and we both went away feeling very happy (and full). This entry was posted in wine tasting and tagged Hahn Estates, Monterey County, Pasagno Winery, Santa Lucia Highlands on September 27, 2014 by vvblogman. My head is still spinning! We are back in Dublin, getting back to our regular routine after having a whirlwind 5 day trip down to the Central Coast wine region. We left last Thursday morning and drove about 2 hours south and found our first winery in the Santa Lucia Highlands wine growing region of Monterey County. We stopped at Pessagno Winery in Gonzales just outside of Salinas. Then we drove about 10 minutes farther south to Hahn Estates in Soledad. Both of these tasting experiences will be written in a future blog. We stopped for lunch in Soledad and had a delicious Mexican meal. We then hit the road for our destination of Buellton which is about 1/2 hour south of Santa Maria and about 45 minutes north of Santa Barbara, smack dab in the middle of the Santa Barbara Wine Country. We checked into the Marriott Courtyard and had just enough time to unpack and change into something nicer for our anniversary dinner we were about to venture on. We went to Mirabelle Restaurant located at the Mirabelle Inn, just off the main highway in Solvang. Larry and I were celebrating our 34th wedding anniversary a couple days early due to the fact that we were going to be busy at the Wine Bloggers Conference on the actual day of our anniversary. We looked at the menu and decided to go with the Chef’s Tasting Menu with with the wine pairing. This turned out to be a very delicious meal, and however great the service was, it was a bit rushed and we found ourselves done with our 4-course meal in 1-1/2 hours! It turned out to be alright since we still had quite the agenda ahead of us with registration and expo with wine tasting back at the hotel. We even had an excursion at 10:00 that evening to Standing Sun Wines where there was a wine tasting of that winery but also over a dozen other wineries were represented there from the Santa Ynez Valley Wine Country Association. They had a beautiful display of desserts of which I passed on since we had just had dessert with our meal. After we sampled wines for awhile we then sat outside around their fire pit and enjoyed meeting fellow wine bloggers. The next two days were filled with wine tastings, both from the U.S. and from around the world; food pairings, seminars, workshops, keynote speaker, excursions to wineries, blog awards, etc. When Sunday morning came around and we finished the last 2-hour workshops we were ready to start heading back north. We only had to go one hour as we were heading to San Luis Obispo. We were going to be staying right in town at a very nice boutique hotel, the Granada Hotel and Bistro. Our room was ready and they let us check in at 1pm! We ordered in room service to our room and watched the final game of the World Cup. We enjoyed this very much as we had been watching a great deal of the games throughout the world cup series. After the game was over we walked around town, did some shopping and found a nice restaurant, Luna Red, where we ordered happy hour snacks and sangrias. The next morning we left to head back to Dublin with stops at 3 wineries in Paso Robles, lunch and a massage. The wineries we stopped at were Niner Wine Estates, Sculpterra Winery and Sculpture Garden and Derby Wine Estates. Each of these were very different from each other and we really enjoyed our experience at each of them. We had lunch at Berry Hill Bistro in the square. We left Paso Robles around 4pm strategically planned so we would miss most of the work traffic up in San Jose. We got home around 7pm. All the animals were good and very happy to see us. We brought in all the literature and business cards that we acquired over the long weekend and now need to decipher through it all. That will take some time. Keep posted as I will be writing more details about the specific wineries, restaurants and highlights from the Wine Bloggers Conference, #WBC14. This entry was posted in Wine Bloggers Conference, wine travels, wine-food pairing and tagged #wbc14, Berry Hill Bistro, Buellton, derby wine estates, Gonzales, Hahn Estates, Luna Red, Mirabelle Restaurant, Niner Winery, Paso Robles, Pessagno Wines, San Luis Obispo, Santa Barbara County, Santa Ynez Valley Wines, Sculpterra winery and sculpture garden, Soledad, Solvang on July 16, 2014 by vvblogman.